All About Sports Cards: The winner for Best Premium Baseball Cards announced. The winner for Best Premium Baseball Cards announced. There are only two nominees in this category but it still took some time to pick a winner. Both sets offer close to the same content, base cards with alternating hits of relic and relic auto cards. Volume and design are the things that separate these two nominees. 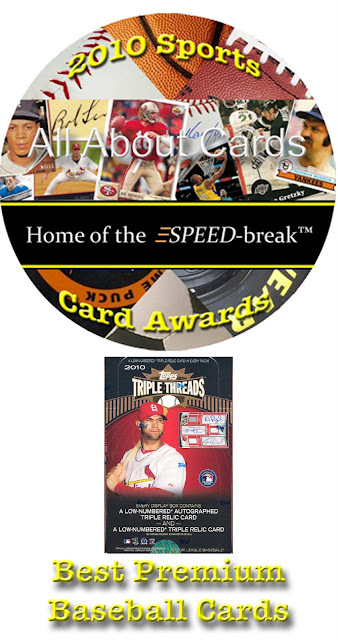 Here are descriptions of the nominees for the All About Cards 2010 Sports Card Award in the category of Best Premium Baseball Cards. Cool base card design, six hits per box and the chance to pull monster booklets like the 1927 New York Yankees starting lineup cut autos, this was a blast to open, as can be seen in our box break. Topps Tribute continues to be a solid product and even improved on last year’s release. This is another improvement over last year’s release, which included jumbo patch book cards. 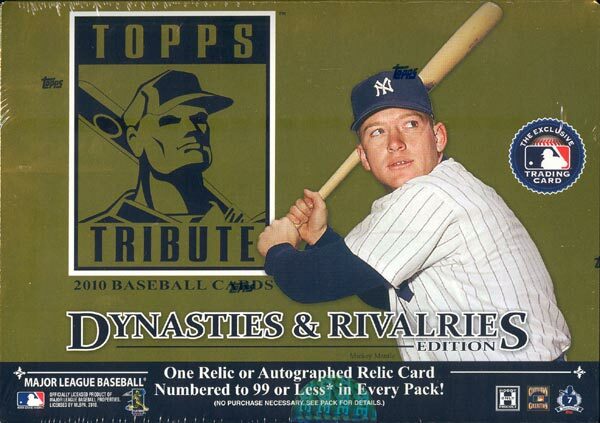 And when people were selling their platelets to obtain Strasburg cards, this was the high end product to have. Choosing a winner from these two releases is a close call. You should be happy owning either product, or both, or any of our nominees in any of our award categories for that matter. So lets look at hits for both sets side by side. I didn’t pull a triple material auto card from Tribute so I’ll have to use the double material auto. I must admit, in mind I always felt the materials in Triple Threads were bigger but looking at them side by side, they appear to be about the same size. So even that seems to be pretty even. One difference is seems to be the price point. 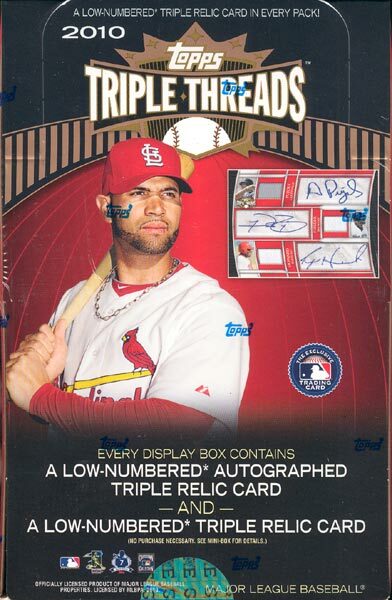 With Tribute at about $50 a pack and Triple Threads at about $75 a pack you are paying more for Threads. But what are you getting for that extra expense? Well… for those of you not ready to put down $300 at a time to pick up a box or take your chances buying the individual packs, Threads offers a low price level to get in for a guaranteed Auto/material card. But a clue to the true difference is in the name. With Tribute you might pull a single, double or triple material, with TRIPLE threads, you are pulling a triple material every time. Collectors love this product and so do we. With triple game used materials on the hits and a higher ratio of booklets, this makes for a great box of cards to buy or receive as a special gift. 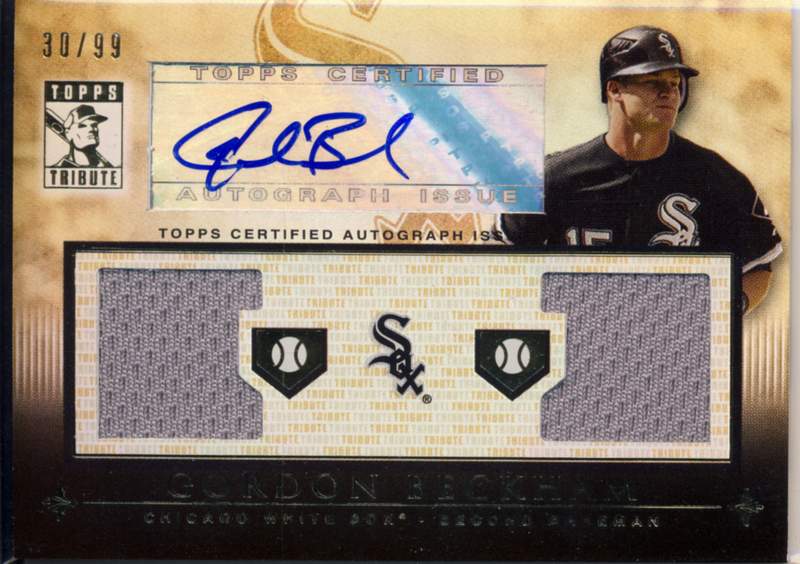 It’s going to be hard to dethrone Topps Triple Threads Baseball in the category. I've never opened either of them, but both look like they'd be fun.